The Nintendo Wii was released on November 19, 2006. You might think that since the Wii is now two generations behind the current Nintendo console, that there are no new games made for it. You would be wrong. The first Just Dance launched exclusively on Wii on November 17, 2009. While it received very negative reception from critics, the game went on to sell very well. This sparked a sequel in the form of Just Dance 2 in 2010, yet again a Wii exclusive, and it performed even better than its predecessor, with reviews becoming more mild. Just Dance 3 was brought over to PlayStation 3 using PlayStation Move and Xbox 360 using Kinect. But Just Dance was not content to be on three consoles. No, it would take over them ALL! Just Dance 4 claimed its next victim, the Wii U. Just Dance 2014 took out two birds with one stone, the Xbox One and PlayStation 4. And finally, Just Dance claimed its most recent victims, PC and Nintendo Switch, with Just Dance 2017. What is shocking, however, is that even Just Dance 2018, planned for release on October 24th of this year, is still coming to the original, 2006, Nintendo Wii. Perhaps exclusively because of Just Dance, some factory somewhere is still making Wii discs at the same time as some other factory coating Nintendo Switch cartridges with grossness. Imagine if the same game were released on NES, SNES, and N64 on the same day! Nevertheless, this is the reality. The Wii was the fifth best selling console of all time, and the most recent amongst those five. Tons of people who don’t normally play video games own a Wii, and that’s the type of audience that Just Dance appeals to. That audience also happens to be my family. 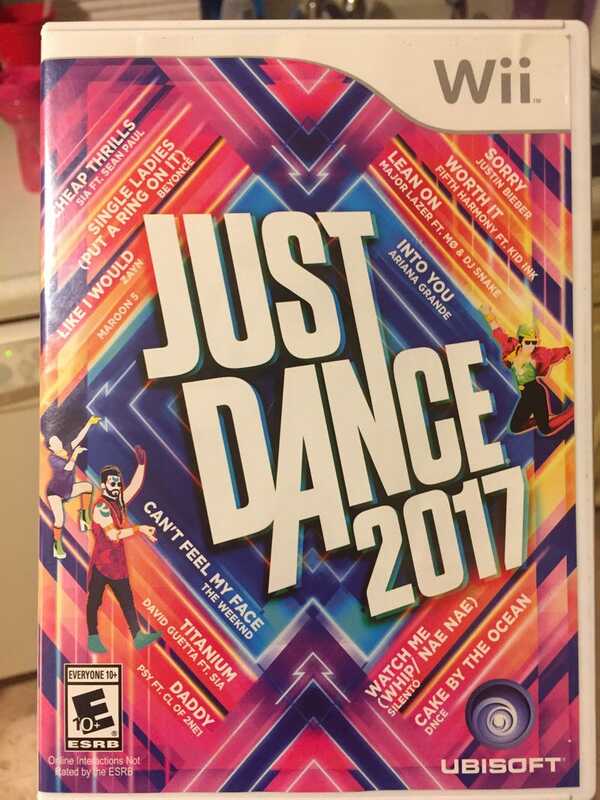 Yes, my family owns a copy of Just Dance 2017 on the Wii. And it’s just Just Dance. Which isn’t a bad thing! I’m not saying that Just Dance shouldn’t be on the Wii, because it really doesn’t affect me whether it is or not. It makes sense from a business perspective because it still makes them tons of money, so let them! The game is the same game I remember playing when I was ten years old, and I’m just as terrible at it as I was back then, just with new music. It might be jarring to play a modern game that’s played on a SD console, and annoying to have to move the bulky Wiimote through the air after being introduced to the lighter-than-air Joy-Con, but hey, it’s Just Dance. What’s wrong with that?